As supported by the data below, children from fatherless homes are more likely to be poor, become involved in drug and alcohol abuse, drop out of school, and suffer from health and emotional problems. Boys are more likely to become involved in crime, and girls are more likely to become pregnant as teens. 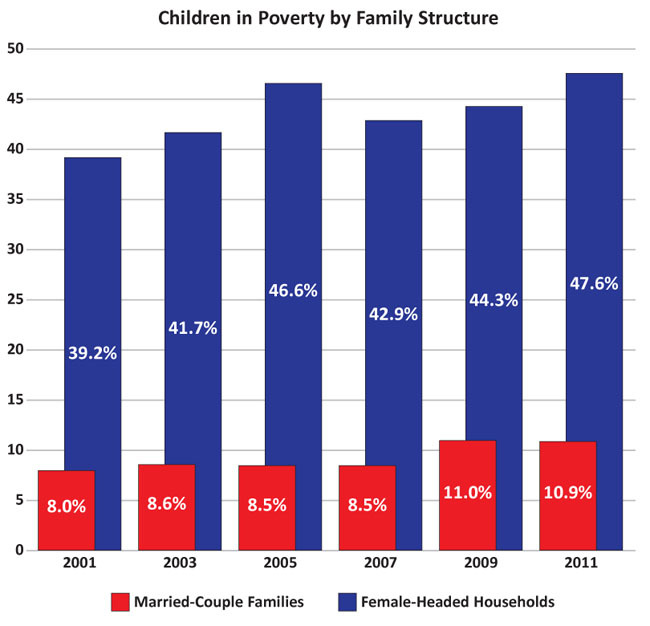 – Children living in female headed families with no spouse present had a poverty rate of 47.6 percent, over 4 times the rate in married-couple families. – There is significantly more drug use among children who do not live with their mother and father. – A study of 1,977 children age 3 and older living with a residential father or father figure found that children living with married biological parents had significantly fewer externalizing and internalizing behavioral problems than children living with at least one non-biological parent. Source: Hofferth, S. L. (2006). Residential father family type and child well-being: investment versus selection. Demography, 43, 53-78. – Children of single-parent homes are more than twice as likely to commit suicide. Sources: The Lancet, Jan. 25, 2003 • Gunilla Ringbäck Weitoft, MD, Centre for Epidemiology, the National Board of Health and Welfare, Stockholm, Sweden • Irwin Sandler, PhD, professor of psychology and director of the Prevention Research Center, Arizona State University, Tempe • Douglas G. Jacobs, MD, associate clinical professor of psychiatry, Harvard Medical School; and founder and director, The National Depression Screening Program • Madelyn Gould, PhD, MPH, professor of child psychiatry and public health, College of Physicians and Surgeons, Columbia University; and research scientist, New York State Psychiatric Institute. – Data from three waves of the Fragile Families Study (N= 2,111) was used to examine the prevalence and effects of mothers’ relationship changes between birth and age 3 on their children’s well being. Children born to single mothers show higher levels of aggressive behavior than children born to married mothers. Living in a single-mother household is equivalent to experiencing 5.25 partnership transitions. Source: Osborne, C., & McLanahan, S. (2007). Partnership instability and child well-being. Journal of Marriage and Family, 69, 1065-1083.